I remember when single-sided printed circuit boards (PCBs) with wires dominated many markets—like whitegoods—because it was possible to keep costs down. This is still done in some instances, but these days, multilayer PCBs are the norm. 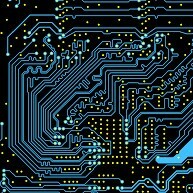 While these handle the fastest high-speed serial interfaces, the move to 56 Gbit/s SerDes (Serializer/Deserializer) may give PCB designers a run for their money, owing to the difficulty of handling the high-speed signals on large PCBs. Issues also arise when moving from board to board, including connector design challenges.